New Classrooms at GHI. Sponsor A Girl in 2015. Team EACH Rocks! Follow us on FB and twitter! The two new classrooms at the Good Hope Initiative are finished and ready for use. We are very grateful to RMH Foundation and all of our generous donors who made this project possible! The girls are nearly halfway through the school year! Susan, Lydia, Sarah, Brenda and Cecelia couldn't have done it without you. The girls are growing up so fast and we continue to need your help so all the girls at Upendo continue to receive a quality education. To sponsor a girl in 2015, please click here. Nduta, Margaret, Njoki and Eudias need sponsors to begin secondary school next year. Did you know that EACH is on social media? Like us on Facebook and follow us Twitter! Our annual fundraiser will be held on 9/23 at 6 pm at Ainsworth Park. Buy your tickets here! Every quarter, we will be posting stories on Facebook and our website about the people involved with East Africa Children's Hope, from the kids we support to events to staff member visits to Africa. This month, we highlighted Team EACH, a group of five fabulous athletes from Stratford, CT, who are looking to raise $15,000 for Upendo and GHI. 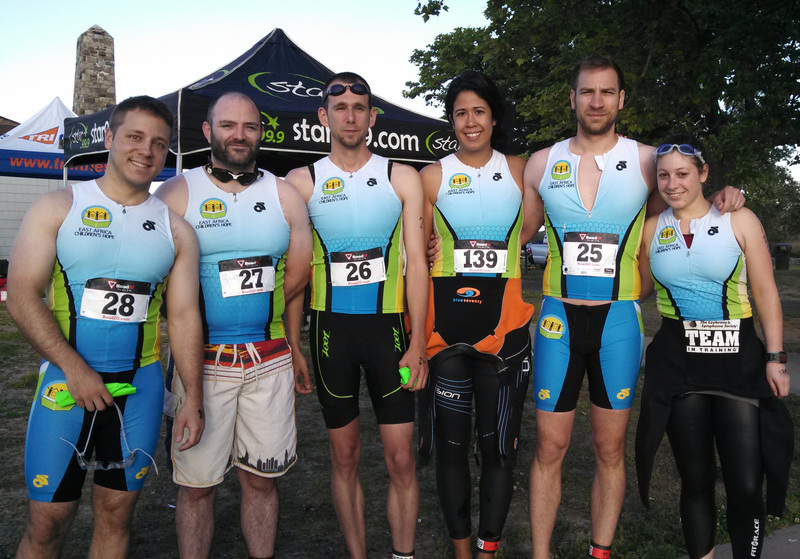 They completed their first race as a team at the Seaside Triathlon on Sunday, June 6th, the day after they held a fundraiser in their hometown. Check out event photos and race pictures by clicking here. Help them reach their goal by donating here. On Sunday, 8/3, Team EACH will swim, bike and run for the kids at the NYC Triathlon. Join us at various locations around the city to cheer them on. E-mail each@eastafricachildrenshope.org for more info. We will host our annual fundraiser on Tuesday, 9/23, from 6 to 10 pm at Ainsworth Park. Click here for more details! Copyright © June 2014, East Africa Children's Hope, All rights reserved.